Margot's LOCAL delivery area only. A holiday centerpiece in traditional Christmas colors makes the table festive and adds candlelight for sparkle and warmth. 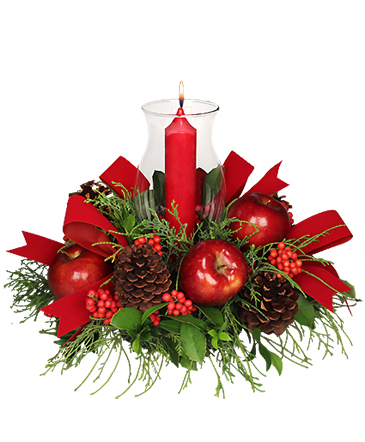 Our VELVETY RED hurricane arrangement makes the perfect hostess gift at any holiday gathering. Fresh winter evergreens along with faux fruit and real pine cones creates this stunning piece.